"Ambode Will Get PDP Form From Me, I'll Sell My House & Buy it"
Former Enugu North Senatorial Aspirant, under the Peoples Democratic Party (PDP), Chinedu Eya, has offered to sell off his Lagos property worth over 53 million naira to purchase nomination and expression of interest forms for the embattled Governor of Lagos State, Akinwunmi Ambode, if the Governor will heed his calls to contest 2019 elections under the PDP. 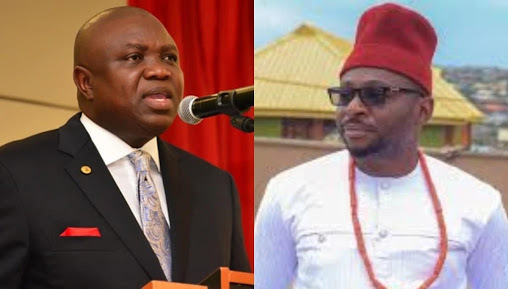 The PDP Chieftain who also noted that the Governor must as a matter of urgency dump APC for PDP to survive the current political turmoil rearing to consume him, hinted that his decision to purchase the Governor’s reelection forms in the PDP, using his building as a bait is to help save Ambode from the gang-up by the the Mandate Movement led by the National Leader of the APC, Asiwaju Bola Tinubu and The chairmen of the 57 councils in Lagos who have already concluded plans to dance on the funeral grave of Ambode’s administration. He further stated that the Governor has nothing to fear about joining PDP as the Party will be willing to clear the route for him and possibly form a consensus that will produce him as the Party’s candidate. Recall that the governor and Tinubu have been in the news in the past few days because of an alleged rift over the second term bid of Ambode.